Review Context: When it comes to Mario games, I have played almost all of them. 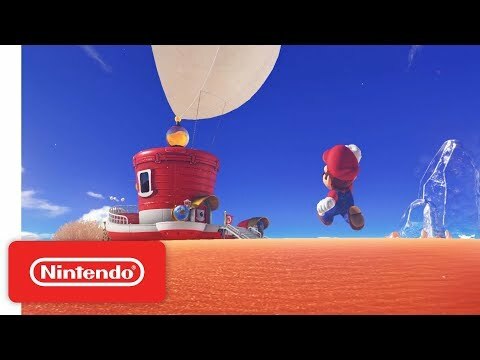 I feel honored seeing the Mario franchise change, as I grew with up the games. I’ll never forget the shock and awe people were with Super Mario 64 changing the platform genre. With the launch of a new console, Nintendo knows how to take full advantage of their hardware. You get 60 frames per second of smooth animation, cute facial expressions of Mario and his enemies, making this one of the most beautiful games I’ve seen on the Switch. The amount of details is crazy, such as the stitching on Mario’s overalls, his hair, and seeing the textures on his hat. Even small moments like Mario getting covered in soot, and his clothes getting wet after swimming. Mario does certain things as callbacks to his earlier work, such as him running with his arms out like in Super Mario Bros. 3, to this hat almost coming off as he runs/jumps like in Super Mario World, and even falling asleep if you live him idle from Super Mario 64. From the second you boot the game it recommends you to play with the Joycons separated. I looked past this as I was expecting to play the game with the Pro Controller. Upon learning that certain moves require you to move the controller in a certain direction, I thought there would be an option to turn it off. Sadly, you can’t. I played in handheld mode thinking the motion controls would be turned off, but aren’t. So I decided to cave in and play with the Joycons separated. After awhile, the controls became second nature just like in Super Mario Galaxy. Granted, the in-game tutorials tell you how to do the moves, but if you’ve played previous 3D Mario games, you already know the controls. The added features come from your friend Cappy. Using Cappy is where most of the motion controls come from as he aids you in your adventure. In hindsight, I wish there was an option to turn off motion controls, but I can understand with how Cappy is used why it’s incorporated. 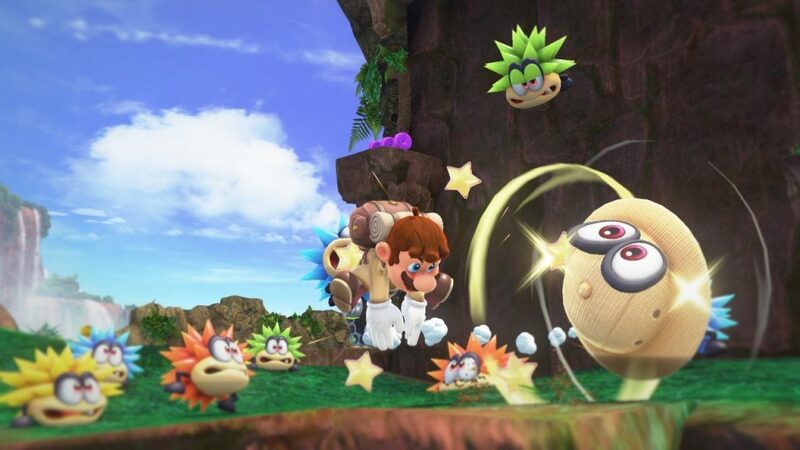 Not only that, but Cappy has an ability that changes the gameplay, as I’ll explain later on. The HD rumble works well, as the rumble increases and decreases based on the action you’re doing. When you roll down a hill the rumble increases as you roll faster, but when you hit something the rumble does a quick shake. A first for a Mario game is when you start a new game it literally starts off with a cutscene of Mario fighting Bowser. Of course, Mario loses the battle with some twists. When Mario gets knocked out the airship his cap comes off and Bowser smashes it causing it to get destroyed in the ship’s propellers. Not only does Bowser kidnap Peach, but decides to tie the knot with her while hiring wedding planners to take care of Mario. 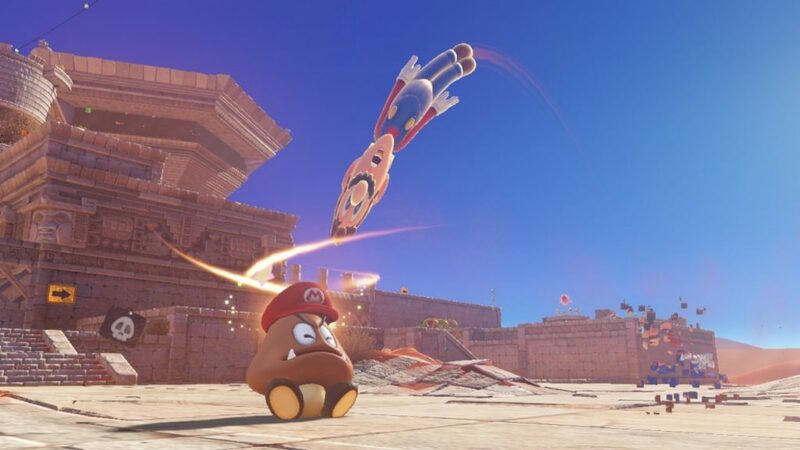 Meanwhile, we are introduced to Cappy turning Mario’s new cap into a weapon. 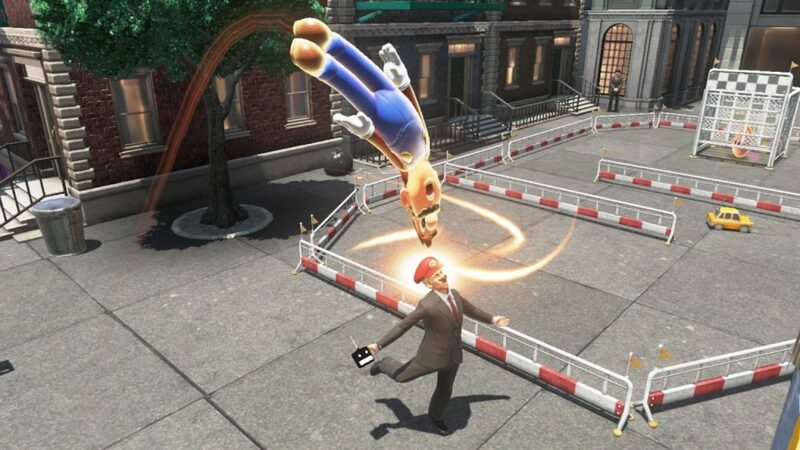 That weapon is the main mechanic to this game, as tossing Cappy to anyone/anything possesses (capturing) their body. For comedic purposes, you will still see Mario’s cap and mustache on that person/object. Depending on whom you possess (capture), the controls will change for a short amount of time or you decide to jump out of that body. I feel this is a game changer, as using a certain body can help you collect items. Speaking of changes, it should be noted that lives have been removed and you are just hit with minus ten coins for your death. Just like Super Mario Sunshine, there are no power-ups in the game. If you find the game too hard there is an optional assist mode. This mode gives you more health and a path to where the Power Moons are located. Power Moons are needed to power your ship to move to other worlds. Among that are other collectibles for each world to collect having you spend a lot of time finding them. What makes this different from Super Mario 64/Super Mario Sunshine is that you can find the items in any order instead of only obtaining one at a time. This game gives you no hints on the locations, unless you ask for help from a friendly Toad (for coins) or parrot (gives you a vague hint). Some are easy to find, while others require thinking. You will be exploring each world with a fine-tooth comb and making sure no stone is left unturned. Really, I found a Power Moon by breaking a stone out of a hunch. As you are exploring, you might get tired of seeing Mario’s normal attire. If so, you can use the kingdom’s secret coins to acquire more outfits. It’s a first for Mario with some attire being original and other attire as callbacks to older games. Like The Legend of Zelda: Breath of the Wild, there is so much to do in each kingdom, you’ll forget about the story to collect all the items. I spent my first day playing the game collecting everything in the first kingdom, only to remember I have more worlds to explore. There is an element taken from The Legend of Zelda: A Link Between Worlds that has you going on the wall as 8-bit Mario. This is the feature that when I showed it off to my friends made them lose their minds in amazement. The game does support local co-op via separate Joycons, but the lack of a second analog stick (camera control) isn’t worth it. Another surprise is the mini-games having an online leaderboard. Amiibos have been released for the game to unlock extra features. There is one feature with the Peach Amiibo I didn’t expect to unlock, but I’ll keep it a secret. The soundtrack for each world is grand and epic, but if you haven’t heard the main song (Jump Up, Super Star) sung by the major of New Donk City, Pauline (Yes, Pauline from Donkey Kong), you are in for a treat with her singing the theme song. Music from previous Mario games can be heard in different locations. When you turn into 8-bit Mario that music’s tune changes to 8-bit as well. The sound effects are done with new and old chimes, with the dialogue kept to just grunts and noises from the characters. There are moments you will be treated to ambient noises, but that is only for a short period before the music starts to kick in.